WhereToFindCare.com Blog: Got Discharge Instructions? Have you ever taken someone home from the hospital and couldn't remember the instructions you were told about how to care for them? It's not that uncommon; the discharge process can be confusing with so many activities occurring at the same time. I recently brought my son home from outpatient surgery and when he asked if he could put ice on his swollen leg I found myself referencing the discharge sheet. Having this important sheet reminds patients and families of things to do/not to do after they leave the hospital. Doing the wrong thing can put you back in the hospital or at a minimum delay recovery. For me, it helped me be very careful in applying the ice as he wasn't supposed to get the area wet for 24 hours. Medicare statistics state that 21% of Congestive Heart Failure patients don't get discharge instructions after a hospital stay. This is concerning considering 25% of all CHF patients will be readmitted within 30 days to the hospital. Rather than try to address and rectify all the failure points in the process from thousands of different hospitals across the country I suggest we try technology based solutions to insure those those critical documents are in patient hands. 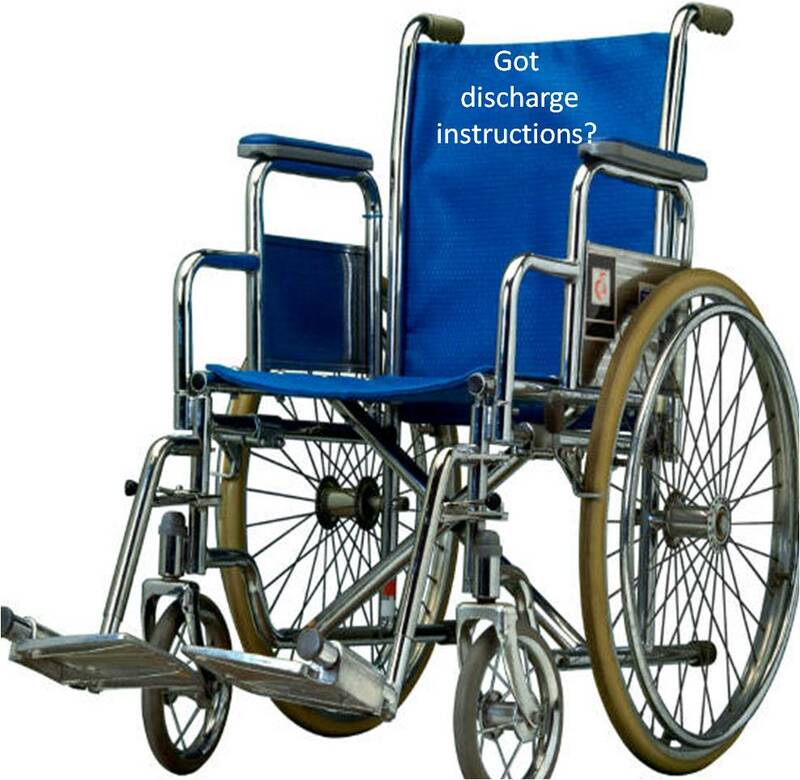 Options can be wheelchair based scanners where patients scan barcode on discharge sheet in order for wheelchair to move, telephone exit survey, or using the patient wristband barcode and a scanner at the hospital room door.